On April 10, 2019, Treatibles introduced its newest product, a Topical Cream for dogs and cats with dermal penetrating ingredients for maximum absorption. The company announced the proprietary blend of ingredients includes organic full-spectrum hemp oil featuring naturally occurring CBD along with supporting cannabinoids and terpenes, shea butter, aloe, organic coconut oil, olive oil, beeswax, methylsulfonylmethane (MSM), dimethyl isosorbide (DMI), sodium borate and vitamin E.
“We strive to provide the most beneficial ingredient profile in all of our products,” said Julianna Carella, CEO and Founder of Treatibles. “As we developed the Topical Cream, absorption was a key element. DMI is a natural dermal penetrant which enables cannabidiol (CBD) and other key cannabinoids to be more easily absorbed into the skin. We also chose to include MSM, which not only supports joints, it can also increase the production of collagen and reduce redness from skin irritations,” Carella said. In a statement, the company said the topical, full spectrum hemp oil promotes a normal inflammatory response, helps reduce discomfort and supports a strong immune system and was ideal for managing hot spots, cuts, burns, scrapes and blemishes. 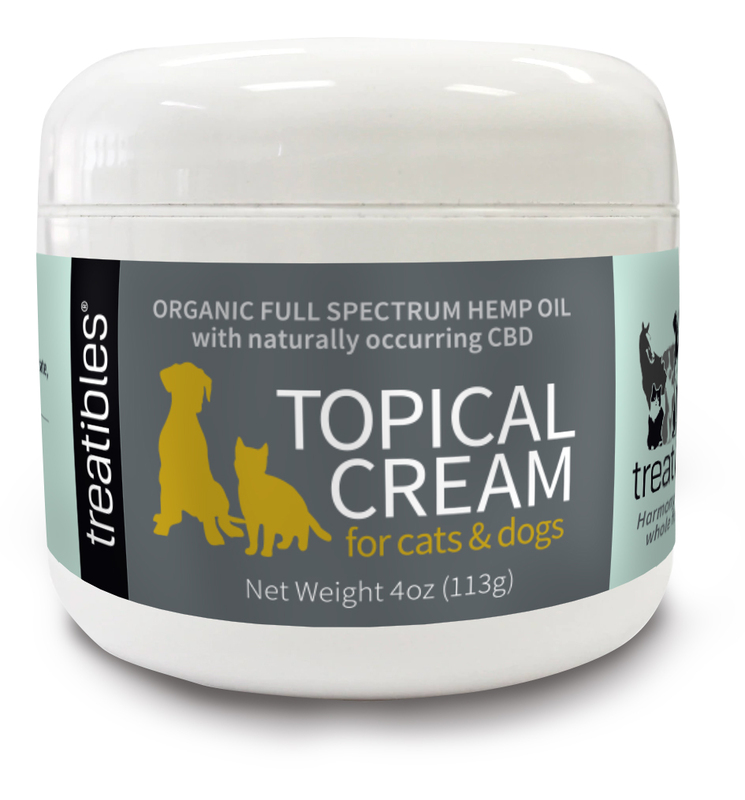 Each four-ounce jar of Treatibles Topical Cream contains 240 mg of organic full spectrum hemp oil. MSRP is $60. “Treatibles Topical Cream is easy to apply. Simply place a small amount on the affected area, on the tip of a pet’s ear or on a hairless area of the pet’s body and rub gently. This product is intended for external use only,” the statement said.